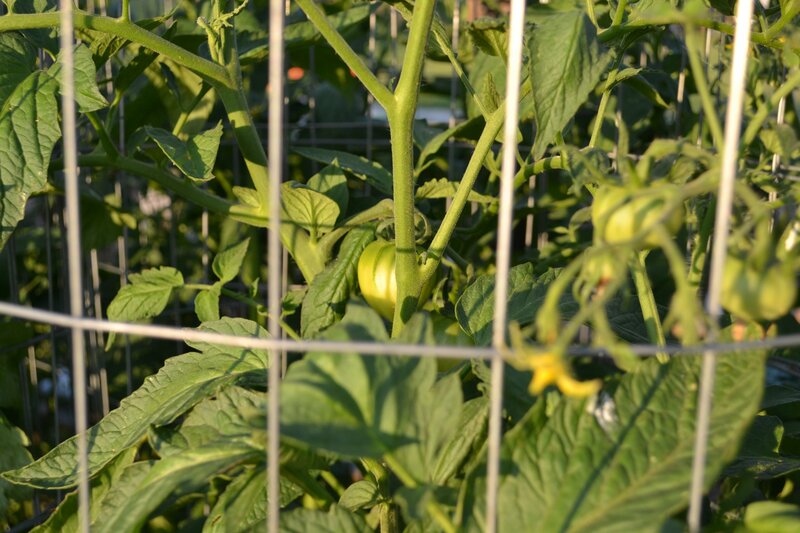 It’s really full-on summer here – though the calendar disagrees with me – in Oklahoma and besides having tomatoes, peppers and basil in the greenhouse, Kel has things humming along in the outside garden as well. As I mentioned in an earlier post, he’s really been a one man show this year as far as the gardening goes. I putter out to help here and there – and to help myself with whatever is ripe – but he’s done 99% of the work, and he’s done beautifully. The full garden with areas under black plastic. Beautiful basil. Our honeybees will go crazy when these are in full bloom. A strawberry plant, new this year. So many grapes this year! Bell peppers from the greenhouse. Potato plants; imagine all of those happy, little spuds underground! Close-up of a straw bale. My artist’s eye loved the tangles of dry grass. Young blueberry plant, covered in unripe berries. One of my contributions: lavender. Red Hot Poker, for the hummingbirds. Wow, Annie, I’m really impressed by your garden. As a child of gardeners, I know how much work is involved in this. Fantastic! You are sweet, my dear! I would love to share strawberries with you! I can imagine what goodies you would invent! Annie, it looks amazing! We’ll be stopping by for some blueberries, okay? We can’t get them here and my son still talks about the yummy ones we ate 4 years ago in France!!! Thanks, Lisa! Your son has good taste ;-). Blueberries fresh off of the plant are a real treat. Thank you for commenting, too! Absolutely stunning. It looks like your plants have about a month or two head start on mine. My tomatoes just started flowering last week. True about the bermuda grass. I’m still trying to get the grass out of my little plot. The ground has gotten too hard for the garden hoe, so I am waiting for rain. Possibly have some this weekend. Bermuda grass is hard to stop. We are very reluctant to poison, so black plastic seemed to be the answer. It’s worked well so far. Yes, we’re due for some rain, too. Annie, Kel is amazing, what a labor of love he has put into that garden. I heart your lavender especially! While I’m seething a bit with jealousy over it, I’m really very happy for you 😉 you will no doubt have many, many amazing posts from your produce that I will benefit from. Hee hee. I think we need to move if we want a garden. We have enough space, but our soil and outdoor water is contaminated with Thallium. We just found out in February. I was mad as a hornet (especially since it was in our drinking water too at the time, nice to find out you have rat poison in your drinking water supply). This is the year I really had a raised box simple garden planned. Blast. Thank goodness our CSA is awesome, but I really wanted the experience of it all, and the cost savings too. Eating vedge has nearly doubled our grocery budget. Whoa! Thallium? Unbelievable. Don’t you just feel like we’re lied to at every step of the way?? What a bummer, to say the least. But good to know you can still get amazing, fresh produce. I hear ya – our grocery bills are pretty high each week. But at least we know we’re nourishing our bodies! So ridiculous, it’s been in the well for years, slowly rising and they only just tell us now when it finally reaches toxic levels. Lots of people in the neighborhood have possible related illnesses. I was going all Erin Brokovitch over it, but then realized I needed a fake rack and a mini skirt, so I handed off the responsibility to someone else. We got a reverse osmosis system in the house with special additional filters to remove the thallium. But outdoor water is still contaminated. BOO! And yes for amazing fresh produce. It is worth the cost. My meds used to run up to $1,000 bucks a month with insurance if I was really sick, so now food is my medicine 😉 Woohoo! What a fantastic garden, so much lovely fresh produce to look forward to over the summer. Your peppers are looking wonderful! Appreciate that, Lorna! Kel has a real soft spot for peppers, so he’s thrilled. This is the first year they’ve worked out for us. We are lucky! So far it’s been a successful year for the garden. Last year we had a terrible drought and lost everything. Such is the way of farming! Feast or famine. Seeing those peppers living on the vine made my heart happy. Someday I will grow my own. Yay! It is really fulfilling. There’s heartache (when the bugs/critters beat you to the harvest), but real pride when you sit down at dinner and get to eat what you produced! OH my gosh your garden is amazing! I love the land you have, I would run around throughout this garden everyday if I lived by you. C’mon over, Brittany. We could really use a farm hand ;-)! Fantastic to see how all the hard work since 2007 is paying off, Annie! Seeing those pictures is making me homesick for my garden – which I left to come here in 2008. On the other hand, perhaps it’s as well – ‘cos ours was not nearly as flat and level as yours and gardening on a slope really was beginning to do for my back and legs: sciatica etc was hitting!! Still that blueberry plant is a monster – mine never, ever got that big and the darn blackbirds ate the fruit before I could get to them!! I specialised in soft fruit and some veggies. Flowers, though pretty to look at, never really justify all the hard work involved, in my book anyway. Congratulations to Kel – and happy cutting, cooking and eating! Thanks, Isobel! He’s really done amazing things this year, bless his heart. Cross your fingers, the birds have yet to find the berries! Fine with me! I came across your blog after you made a comment on Tiffany’s blog. Wonderful to find some ‘older vegans” to relate to. Hey! Thanks for coming by – always nice to meet someone new :-)! Time to make pesto, don’t you think? your garden is so beautiful!! I hope that by the time i’m out of college and in a house I can grow things this well. ^_^ you are living the way I want to when i’m a real adult haha (im still in the mooching college student young adult phase of life LOL). gorgeous pictures! aw I just love it all!! you are so cool! It took me a while to get to this place in my life, that is for sure! But I had a lot of fun getting here, too;-). Big hugs, Charlie. You are too cute. What a big beautiful garden! How many acres are you on? It looks as if you have a lot of space to work with! Looks like you’re in for a beautiful bountiful crop all season long!! Can’t wait to see what you create with it! We’ve got a total of 160 acres – most of which is woods and pastureland. The garden area is a full acre, but includes fruit trees, grapes and perennial flower beds as well as the veggie garden. Fingers crossed this year we get some good yield! Last year we were wiped out by drought. Thanks, Sophie! This spring was so warm here, everything got a head start. It’s gorgeous You and Kel are to be congratulated. You make my dream of moving somewhere with a bit more open space for a larger garden. Thanks! Kel gets 99% of the credit ;-)! I love your garden 🙂 it looks beautiful. Oh I am in love with your garden… beautiful! Where in OK are you located, if you don’t mind me asking? We are a little south of Guthrie. I am trying to get back in to my garden this year but it’s a very slow crawl and late start! We kind of lucked out this year – it’s been a warm spring and we got an early start for once. Last year was such a disaster because of the drought. Of course, it ain’t over ’til it’s over – we could still get wiped out! We’re about 2 hours south of Tulsa. Nice to meet you ;-)! Good luck w/ your garden! You do have to let it grow a little before munching on it ;-)! But it is hard to resist! Wow, I’m so jealous! I have a small spot in our backyard and am growing tomatoes 🙂 Still working on it though, no fruits yet. Crossing fingers. It’ll happen! You’ve got the climate! Thanks! A far cry from last year’s garden!